Vertical Runner youth running member Anya Waldes, 11, runs on a trail during practice Tuesday, Aug. 7, in Breckenridge. The group meets once per week to pre-run the Summit Trail Running Series course, or simply enjoy spending an hour running a few miles on local trails. When: Wednesday, Aug. 16 at 6 p.m.
Day-of registration is $27 for adults. This race begins at the Gold Run Road trailhead, found about one mile south of the Breckenridge Golf Club on Gold Run Road (follow until it turns to dirt). To register and find out more, including course maps and previews for all races, see BreckenridgeRecreation.com. Summer might be coming to a close, but there’s still plenty of time to get out on the trails. The Vertical Runner kid’s running group meets once per week on Mondays until late September, beginning at 5:30 p.m. The group is best for kids between ages 6 and 12 years old. Kids simply need to bring running shoes, running clothes, water and a raincoat, just in case. Every session includes stretching, a warm-up and a run of 4-5 miles on local trails, all led by local ultra-runner Helen Cospolich. Parents are welcome to join too! For more info, call the shop at (970) 423-6116. When you’re a kid growing up in Summit County, all you want to do is run through the woods with your friends. Add a few mud puddles and trail running becomes a little slice of heaven on earth. “Do you remember the mud race?” a youngster with the Vertical Runner youth running group asked on a chilly, rainy afternoon in early August. The six young runners, all between the ages of 9 and 11 years old, were dressed in neon running shoes, bright athletic shorts and raincoats zipped tight against their necks. 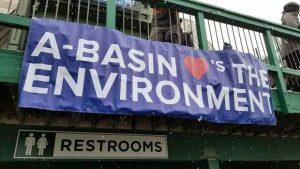 They’d just finished warming up with jumping jacks for a run along the Blue River Trail south of Breckenridge when talk turned to the last time everyone got to splash through the mud. “No…,” replied Wyndam Pierpont, an 11-year-old boy wearing a backwards hat. He looked a little miserable in the rain, while just about everyone else seemed like they could care less about the chilly drizzle. As the rest of the group started taking off raincoats, including his 9-year-old brother Auden, Wyndam kept his speckled coat on for as long as possible. 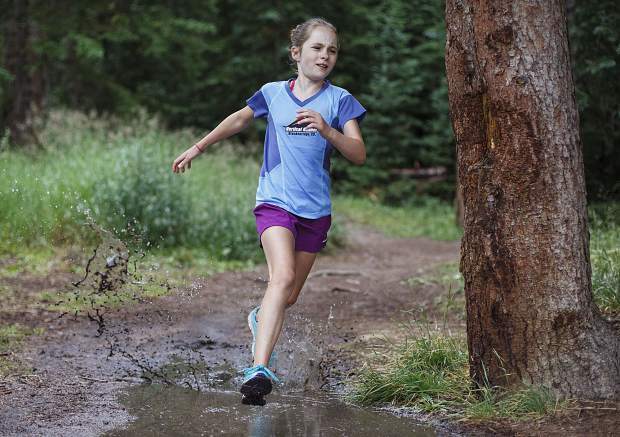 “You don’t remember the mud race?” 11-year-old Anya Waldes said incredulously, then started reliving that wonderfully muddy day in mid-July at the Baker’s Tank trail run, one of six events in the summer-long Summit Trail Running Series. It was the first downpour after several weeks of near-draught conditions, and when the course filled up like a long-forgotten swimming hole, race organizers decided to cut the 9K long course and funnel everyone onto the 4K short course, where the mud puddles were deep and the laughter was endless. And the day was about to get even better. Earlier this summer, Vertical Runner’s new owner, Dean Eastham, decided to launch a youth counterpart to the store’s wildly popular adult running group. The idea was to get kids together for preview runs on trail series routes, but beyond that, he simply wanted a place for kids who love running to be with other kids who love running. But first, Eastham needed community coaches with the background to get a youth team off the ground. He found a perfect fit in Cospolich, a past Leadville 100 winner whose daughter, 11-year-old Alina, came to practice that rainy afternoon in August. Cospolich knows a thing or two about running. Along with the Leadville 100, she’s made the podium at the Hardrock 100 in Silverton and finished in the top-10 at Ultra-Trail du Mont-Blanc — the end all, be all of European endurance races. She’s a monster on the endurance scene, but she still understands how to get kids excited for an hour or two on the trail. Coach also has plenty of experience with photo shoots for running magazines, and on that rainy afternoon, she gave her crew tips on how to look the absolute best while running through mud puddles. As the kids waited to get started, the conversation turned to what they like most about trail running. “It’s trail running!” came the group response, followed by plenty of laughter and yelling. Waldes thinks about winning — she took first for her age group at the 6K Horseshoe Gulch race and 8K Carter Park run — while Alina Cospolich, like her mom, usually thinks about nature. The Pierpont boys get distracted by squirrels and nature and the next town series mountain bike race; Wyndam prefers biking, Auden prefers running; and 9-year-old Talia Rupert just likes to run. Some like rainy days, some like sunshine, but all of them were itching to run already. Cain Steinweg was there with his father, Paul, and like everyone else in the group, the 9-year-old got more excited — and more restless — as he waited for the photo shoot. The conversation turned once more to past races and Steinweg mentioned something about “super-manning:” when a runner flies hands-first into the ground on a descent. 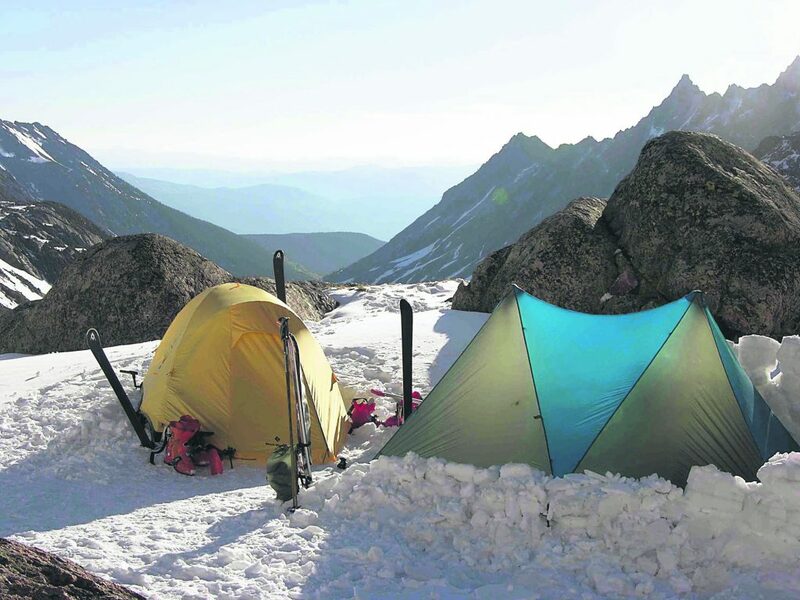 “I’ve super-manned like five times on a downhill,” Waldes chimed in, and again everyone started talking and chattering and yelling about that one time they got super-manned at a race or during practice or just about anytime. “OK everyone, are we ready?” Cospolich said and the group hushed almost immediately. It was finally time for the photo shoot — and that meant mud puddles. Moments later, the group was flying through the woods single file, laughing their way through puddles and easily outrunning the two adults with the group, including the Leadville 100 veteran. The competitive side comes with time, she said, but for now, it’s all fun.